This article was inspired by Ben Snyder’s book, Everything’s a Project: 70 Lessons from Successful Project-Driven Organizations. That was what a reader got in touch to ask recently. 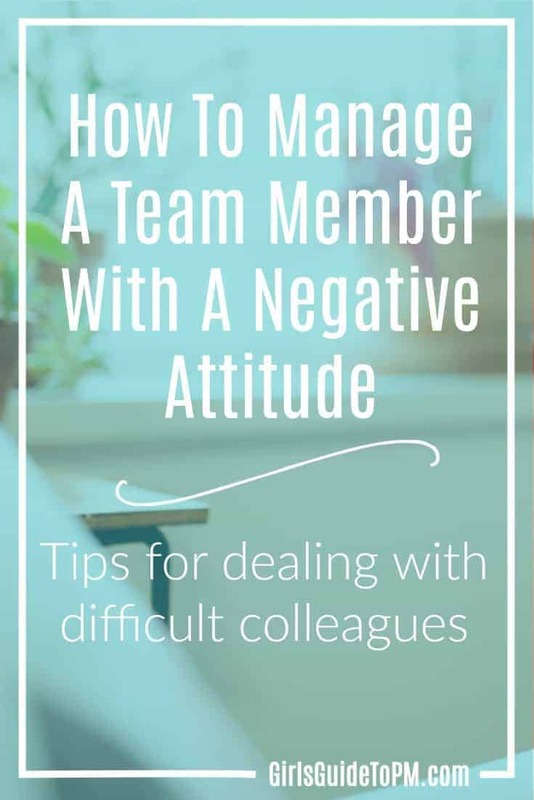 It got me thinking about times that I have had to manage a team member with a negative attitude and fortunately there haven’t been that many. Maybe that’s because I deal with people problems before they become huge sources of conflict (ha! No it’s not that) or I’m such a paragon of leadership (ha! It’s definitely not that) or because I’ve been lucky with always working with professionals who care about their work (yep, more likely to be that one). Having said that, in my line management role I had to deal with individuals who didn’t work in the professional way I would expect. And I know my team members have had people in their teams who haven’t had the attitude one might expect. I know it’s not uncommon – I’m sure it’s not just that one reader who is facing team members who don’t turn up to work ready to do their job. Let me tell you what I think that looks like and what you can do about it. There’s a difference between having a bad day (or week, or month) and more generally having an negative attitude on a project, or to work more generally, so let’s deal with that first. I frequently have bad days. These generally happen where I’ve had less than 4 hours unbroken sleep because I have little boys who do not sleep either. I make it to work; I want to do a good job but I find it hard to concentrate on anything that needs concentration. So I do the easy work on those days and procrastinate on the bigger jobs. That’s not a negative attitude – at least, not in my book. That’s life for millions of working parents, and we catch up on sleep eventually and turn it around. It doesn’t affect my performance overall. 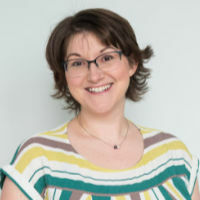 Bad days happen for any number of reasons – bad months happen too, when team members have huge life upheavals such as moving house, illness in the family or a bereavement. As managers, we make allowances. But you shouldn’t make allowances for negative attitudes in the workplace once you’ve established that there is nothing else going on. Making the team feel like they have to carry this individual and do their work so the project doesn’t suffer. Understanding their motivation for their behaviour and what motivates them to work is a good place to start, especially if you notice discrepancies in their behaviour. Perhaps they perform well for someone else or do a fantastic job on a different project. That could point to it being a personality clash, lack of understanding or lack of support for your project’s goals. What would encourage them to behave better? Find out, and see if you can offer it to them. There are some ideas in my ultimate guide to getting people to take responsibility at work. 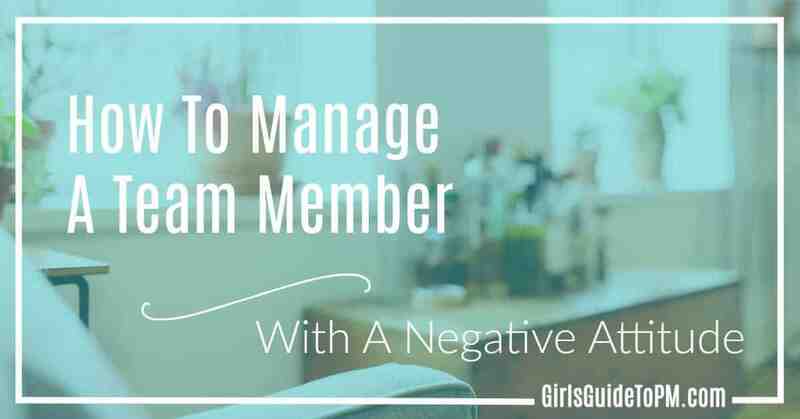 Work with them to address any issues they are facing, especially if they don’t understand how their negative attitude is affecting the rest of the team. Lack of skill can also manifest itself as a poor attitude at work, so help them improve their skill levels if they are open to that. You can also work with HR and/or their line manager to put together a plan to help improve performance. Review their objectives: did they know what was expected? Were the objectives achievable? Have other business priorities meant they couldn’t achieve them through no fault of their own? Think about the individual’s skill, willingness, openness to learning new things and improving their performance and see how these elements may have affected their ability to perform. Review the environment: do they have the tools, resources, systems and processes required to do the job? Find out if the individual realises they are underperforming in your assessment. Help them see the situation from your perspective, and make a big effort to see it from their perspective. Organise 360 feedback if you think it is beneficial. Re-set goals; make action plan. Monitor action plan and provide support as required. Really not a good choice. Coercion is where you use the threat of action to get them to behave in a certain way, such as threatening a demotion, or a poor performance review. It’s too easy to spill from this into workplace bullying. This is not going to improve anyone’s attitude. Don’t go there. If you’ve tried performance management and haven’t seen any effect then this is where you go next. A team member with a negative attitude can destroy your project team from the inside out. Think of the resentment from other people at the fact they have to do that person’s work. And they’ll be secretly criticising you for not doing anything about it. Once you’ve exhausted your plan to help improve their performance, just get rid of them. If you think they can contribute effectively on another team where there aren’t personality clashes or other causes of the conflict that you’ve seen, then move them to where they can do a quality job for the company. If that isn’t possible, manage them out. I’m not an HR professional and I know that employment laws vary around the world, so take advice on whether you do this and how you do this. But for the sanity of the rest of the team, and the success of the project, I really feel that this is the best option in the majority of truly ‘bad attitude’ cases. Let them use their skills in an organisation which is a better fit for them. I bet that 99% of the people you work with are dedicated, committed professionals. Negative attitudes at work aren’t unknown, but they aren’t really common either. Hopefully if you come across someone who can’t work with, you now have a better idea about what to do. Shortcuts to Success: Project Management in the Real World: my book has a section on managing project teams. Results Without Authority by Tom Kendrick: helpful suggestions for dealing with people when you don’t have line management responsibility for them. The Accidental Leader by Harvey Robbins: includes tips on meeting a team for the first time and setting expectations for performance. That is one interesting case, indeed. We all face it at some point and these tips come in very handy in both personal and professional situations, thanks for sharing. Thank you for that article. It’s not simple to motivate negative people. I think it demands more creativity and convinction than others. Thank you .